E-Leather, a UK-based environmentally friendly materials technology company, is helping bus and coach operators provide passengers a seat with a difference. E-Leather is easy to clean and will maintain its high-quality appearance without scuffing or bagging over time. Therefore offering the bus and coach industry a real advantage, as well as giving customers a premium travel experience. "It’s no secret that most operators are focusing their attention on the customer experience, with the aim of adding value to journey’s through enhanced comfort, cleanliness and better services," E-Leather Global Manager for Ground Transport Alexandra Bennett says. "Something we have worked hard on is finding ways to make it easier for operators to achieve this." Selecting high-quality materials, such as a leather fibre composite from E-Leather, helps ensure customers receive a clean, hygienic and comfortable journey, and are therefore more likely to select that mode of transport. 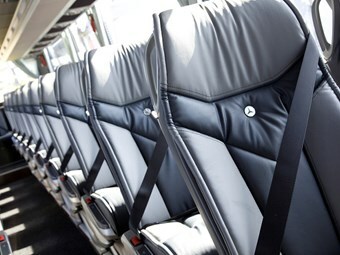 E-Leather is already used by more than 200 airlines around the world and has been adopted as standard seating material by leading UK operators Stagecoach and Arriva. With a range of 30 colours and multiple grain and embossed finishes to choose from, operators can create interiors that really stand-out. E-Leather is now available through Reatex Marketing, one of Australia’s leading suppliers of bus seating fabrics. Stock of E-Leather has already arrived to Reatex’s warehouse in Brisbane. "We are excited to be offering a genuinely unique product to local Australian operators," Reatex’s sales manager Brett Imberger says. "E-Leather is an excellent addition to our range of moquette (pile) and flat woven fabrics; we expect it to appeal to a range of operators and applications from luxury to airport shuttle buses." Indeed, E-Leather supplied by Reatex is already in use across the Tasman in New Zealand. Mana Bus now has three double-decker coaches trimmed with E-Leather seats. "Mana Bus has been very happy with the performance of the E-Leather in their sleeper bus which does the daily Auckland to Wellington route," Imberger says. Reatex has been servicing the local bus and coach seating market for the past 30-plus years partnering with leading global producers such as E-leather. Together they are committed to partnering with local operators to provide the world’s best products in colours and designs that work for the local market.